In 1999, five days rocked the world as tens of thousands of demonstrators took to the streets of Seattle in protest of the World Trade Organization. Among them are Django (Andre Benjamin), Sam (Jennifer Carpenter), Lou (Michelle Rodriguez) and Jay (Martin Henderson). United in their desire to be heard and to make a difference, for these protesters, this is very personal and the stakes are higher than mere politics. A peaceful demonstration to stop the WTO talks quickly escalates into a full-scale riot and an eventual State of Emergency results. The streets are mayhem, the WTO is paralyzed. Caught in the crossfire are Seattle residents, including its beleaguered mayor (Ray Liotta), a riot cop on the streets (Woody Harrelson) and his pregnant wife (Charlize Theron). The choices they make will change their lives forever. 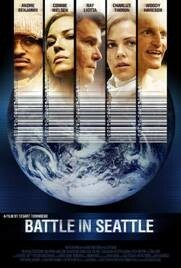 With his ensemble cast writer/director Stuart Townsend intertwines different points of view from a cross section of society – from protestors and police to delegates and doctors – who intentionally or accidentally find themselves on the streets of Seattle in those last days of the millennium. Townsend seamlessly merges footage of the real event with his fictional narrative and, ultimately, Battle in Seattle illustrates that, even against incredible odds, ordinary people can change the world.